This book is an in-depth look at the ins and outs of the commercial aviation industry as it stands today. Featuring a detailed explanation of the various security programs that are in place today, it will help the reader understand the policies and procedures that have been established to keep the skies of our nation safe. 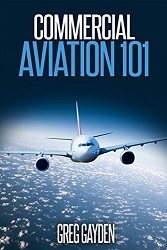 For those who are also interested in learning some of the basics of the commercial aviation industry, it also features detailed descriptions of common terms and practices used by commercial airlines and airports today. Among other things, eaders will learn how airports make money, how to identify different commercial aircraft as well as dozens of various terms in the Glossary. It takes the reader through a history of the industry, from its inception to the changes wrought by deregulation in the late 1970s through the current era. For those with very little knowledge of the industry to old hands, there is something in here for everyone. Greg Gayden has over 15 years of experience in the aviation security field, working with the various rules and regulations that are in place to ensure the integrity of the commercial aviation system. Gayden also operates a website devoted to commercial aviation, airplane spotting, and photography.